Over the weekend of September 25 to 27th I traveled to Phoenix, Arizona for the Second Amendment Foundation’s 2015 Gun Rights Policy Conference. I delivered a short address from the podium on Sunday the 27th that was video-recorded both by the Polite Society Podcast and C-SPAN. In addition I was interviewed before my speech by the Polite Society Podcast and both before and after by Ernest Hancock’s Declare Your Independence radio program. 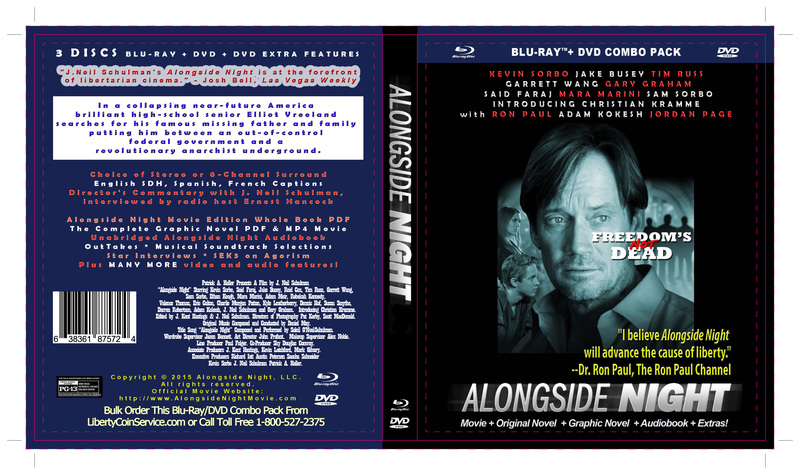 Copies of the Alongside Night 3-disc Blu-ray/DVD Combo Pack and a bulk order form were placed on the conference attendee’s seats. The libertarian movement as I first knew it has lost its way. Disrupted by narrow ideology and petty squabbling over single issues it has been marginalized and the power of its message dissipated. There needs to be a New Libertarian movement refocused on the original Revolution built from the ground up, and I decided a conference of activists devoted to at least one, if not more, of the Bill of Rights was a proper place to start. Here’s my address to the conference plus my interviews. This, and Alongside Night, are presented in the hope it will remind freedom-lovers what the libertarian movement was, and will again be, about and inspire the work needed to free us all. Like the Phoenix of legend out of the ashes comes a rebirth. 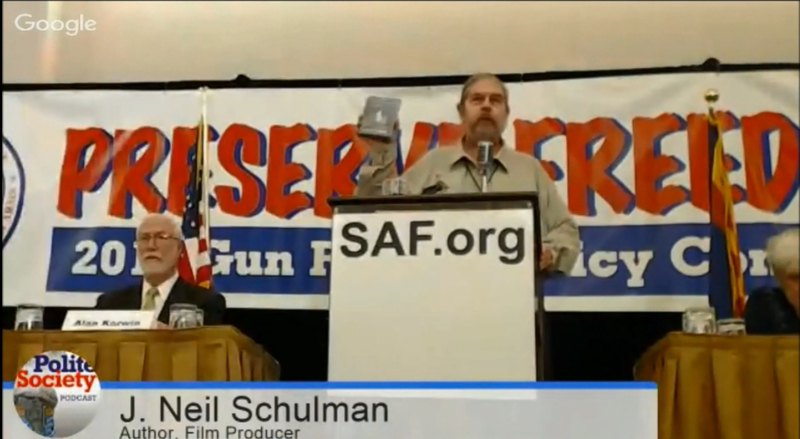 I’m J. Neil Schulman, author and filmmaker and I made this movie, Alongside Night, about the American Revolution returning in our time, and we gave copies to just about everybody who came to this conference. And for those of you watching on C-SPAN you can go to Amazon.com and buy it. So let’s talk about the first American Revolution. Ralph Waldo Emerson wrote those words about felons illegally in possession of firearms who on April 19th, 1775 used those illegal guns to shoot at police legally appointed by the governor to confiscate their illegal guns. In the exchange of gunfire three cops were killed and nine cops were wounded. Sheriff David Clarke, I have bad news for you. This country was founded by cop-killers. Roughly 226 years later, on September 11th, 2001, four commercial jetliners filled with passengers, flight attendants, and flight crew – all of them disarmed of firearms by United States federal law – were overpowered by Jihadi militiamen armed only with box cutters, four per aircraft. Two of those captured aircraft were used as weapons to crash into New York’s twin towers financial headquarters, one crashed into the U.S. military headquarters in Washington DC, and one flight – where the disarmed passengers, none of them with military or police uniforms or badges – fought the jihadi militiamen who rather than surrender crashed the plane into a field near Shanksville, Pennsylvania. The casualties that day were just under 3,000, but in subsequent years wars in Afghanistan, Iraq, and elsewhere costs the United States thousands of more lives, trillions of dollars, and a wounded warrior class. Gun control gave us 9/11. I’m a writer and filmmaker who has sold stories and screenplays to Hollywood production companies, including an original script for the Twilight Zone, broadcast by CBS in prime time, March 7, 1986. My new narrative feature film, Alongside Night, based on my first novel published in October 1979, was given out to participants at this conference, as a counterpoint to the usual Hollywood movies that treat privately held firearms as dangers to public safety. Hollywood writers and producers led by Harvey Weinstein hate private gun ownership yet the entertainment industry makes movies and TV shows full of guns. Hollywood gets past its own objections by having these guns be either futuristic ray guns or ordinary guns used to shoot the heads off zombies, or by having the guns be used by cops. Prime time U.S. television is dominated by shows featuring law-enforcement officers and military service personnel as the armed heroes. On the other side is a political right-wing dominated by politicians who assign absolute human rights only to the unborn. Anyone breathing air has only government granted privileges – driving licenses, gun licenses, work permits, and so forth. They talk about a “right to work” but want to build a wall to keep out workers. They want gun rights only for the law-abiding – in other words, anyone who meekly complies with thousands of tyrannical regulations. I’m here to agree with the signers of the Declaration of Independence – a legal document more binding than the Constitution — that when any government’s police and regulations become oppressive of the people’s rights the people have the moral right to resist abuse of their rights under color of law – and existing federal law agrees with me. Look up Title 18 US Code Section 242 which says that any official – local, state, or federal – who violates constitutionally protected rights is acting as a criminal and has zero legal authority to do so. By the way, the Second Amendment in a recent Seventh Circuit decision, applies to illegal immigrants. And I need to tell you something that is not going to be pleasant for a lot of you to hear. It also applies to drug gangs because nowhere in the U.S. Constitution is the word “drug” mentioned and according to te 9th and 10th amendments if it ain’t listed in the Constitution as powers of the federal government anything they do on this subject is void ab initio. That’s how Black Lives Matter and defenders of the Bill of Rights – you in this room — can get together. 2015-09-25 Hour 3 J neil SCHULMAN from Ernest Hancock on Vimeo. 2015-09-29 Hour 1 J Neil Schulman from Ernest Hancock on Vimeo. Due to the college campus shooting today at Oregon’s Umpqua Community College I decided to add two additional videos. This entry was posted on October 1, 2015 at 6:05 pm, and is filed under A Filmmaker on Film, Agorist Studies, Alongside Night. Follow any responses to this post through RSS 2.0. You can leave a response or trackback from your own site.